It took a long time, but summer has finally graced us with warm weather. That means it’s time for barbecues, fireworks and simply spending time outside. Not only is being out in the open in the warmer months enjoyable, it is also good for senior health. 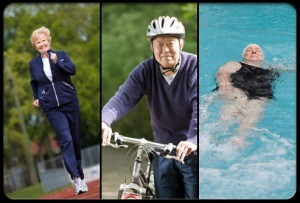 We already know how important exercise is for seniors. Sometimes the bitter winters make it next to impossible to go outside and be active. But when the snow melts and the winter coats are packed away, it’s far more inviting to step outside into the warm sunlight and be active. Eating healthy is another way that summer can be beneficial. It’s much easier to make an effort to eat better when most fruits and vegetables are in season. Especially with all of the farmers’ markets that pop up every year, healthy produce is more accessible than ever! Sun exposure is also extremely valuable for the health of seniors. While too much sun can certainly be a bad thing for people of all ages, a reasonable dosage provides the body with substantial amounts of Vitamin D. Proper amounts of Vitamin D can regulate healthy levels of cholesterol. Summer is also a time to decrease stress. There are a few holiday weekends that mean time off work, but it’s also a time where many people take vacations. With time to do whatever you want, it’s easy to kick back and relax. While the summer months can be extremely beneficial, the time spent outside should also be approached with caution. Too much caffeine or alcohol increases the rate of dehydration and should be used sparingly. Drinking plenty of water and staying in the shade are easy ways to enjoy the nice weather in a safe manner.